Once there was a man who had a very hard way to practice Buddhism. Whenever he encountered another person, he would bow to that person and say, "I would never disparage you, for you are practicing the Buddha way and all of you will become Buddhas!" Because he said this to people, he was given the name Bodhisattva Never Disparaging. A bodhisattva is a person who practices Buddhism for the sake of others. And he was called “Never Disparaging” because of what he would say to people. To disparage means to look down on someone, to think ill of that person. 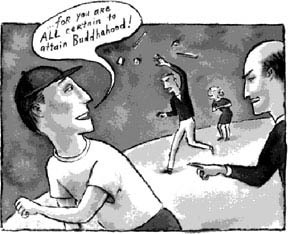 When people heard Bodhisattva Never Disparaging say this to them, some of them realized what a good person he was. Some of them bowed in return and thanked him. But others yelled at him and cursed him. Some of them said “Who are you to say that to me?” Some of them said “I don't remember asking anyone to worship me!" Some of them threw rocks and sticks at him. People often made fun of Bodhisattva Never Disparaging. Sometimes he was even beaten. But he never gave up his way of practice. He really believed that each person he met was a potential Buddha. No matter how much people spoke ill of him or hated him, he never doubted this. And he thought it was only right to tell people about being a Buddha. He thought they should know this. Before he died, Bodhisattva Never Disparaging was able to hear the Lotus Sutra. His behavior throughout his life showed great respect for all people. And, in telling people that they have Buddhahood inside, he saved them from suffering. He was a great Buddhist teacher. Eventually, Bodhisattva Never Disparaging was reborn as Shakyamuni himself.